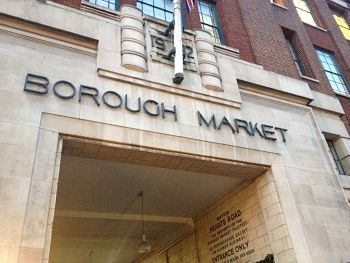 Borough Market is London’s oldest and busiest food markets, just off London Bridge on the southbank and is surrounded by pubs and restaurants. The full market is open Wednesday to Saturday, and also for lunch Monday and Tuesday. There are also a number of restaurants surrounding the market that can cater for gluten free – these are reviewed separately here. Most of the stalls mentioned here trade in the Green Market – there is a great map on the Borough Market website. Also check the website for public holiday opening hours. This has been a saviour for me a couple of times when we’ve been at a nearby pub, but I haven’t been confident about the food there, so nipped over to the bakery and had some cake to save me from starvation! You will be licking your lips at all the options available to you. The inner child in me loves a gingerbread man, so I can’t leave without one and it is also a crumb free option to sneak bites from when not buying food at the pub 🙂 Around two thirds of the products are also dairy free. There are also some sugar and egg free options. 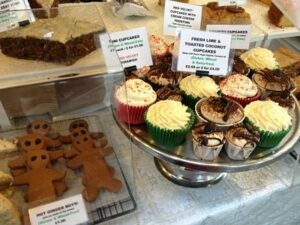 For other 100% gluten free finds around London, click here. The Flax Farm has gluten-free Flaxjacks© made with quinoa and millet flakes (their other Flaxjacks contain oats) and a fruit, such as raspberries or dates. They trade in the Green Market, Thursday-Saturday. 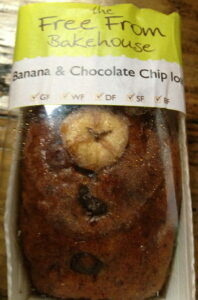 The Cinnamon Tree Bakery does a gluten free brownie, but bear in mind it is a wheat bakery. They trade in the Green Market, Thursday-Saturday. The Veggie Table – this is a vegetarian stall that sells hot food, and you will find plenty of gluten free options, including a burger (no bun), salads, curries and soups. There are also vegan options. You can find a 2103 review at theceleriac. They trade in the Green Market, Thursday-Saturday. Kappacasein’s Swiss raclette – you can have melted Ogleshield cheese via the raclette, on a pile of new potatoes. They trade in the Green Market, Thursday-Saturday. Feng Sushi, unsurprisingly, is a Sushi restaurant that has a GF sharing platter along with some other gluten free options – including Tamari instead of soya sauce. I’ve included this here as well as on the Borough Restaurants post as it is a good takeaway option. Horn OK Please – Vegetarian Indian street food – check out their dosa (like a crepe) filled with masala and potatoes, but make sure it is a gluten free version as sometimes they use semonlina. Open Mon-Thurs 10am-5pm, Fri 10am-6pm, Sat 8am-5pm. Gujarati Rasoi – Indian food with lots of gluten free options. Open Mon-Sat 10am-5pm. The Cool Chile Company is a supplier of Mexican products and they make their own corn tortillas that are preservative and gluten free. They trade in the Green Market, Thursday-Saturday. Boston Sausages have some (gluten free tested) sausages, chipolatas and burgers and an outlet at Borough market if you want to cook at home. Do you need some kangaroo, crocodile or camel? (I found this company looking for kangaroo for an Australia Day party!) The Exotic Meat Company website states that it uses gluten free seasonings – worth asking if you are after something a little bit different. Utobeer is a a specialist beer company at the market where you can pick up a gluten free beer (Peter’s). If you are after a more substantial meal, some restaurants around the market are reviewed here.